HOME PAGE > CASTLES FOR SALE > Ref. 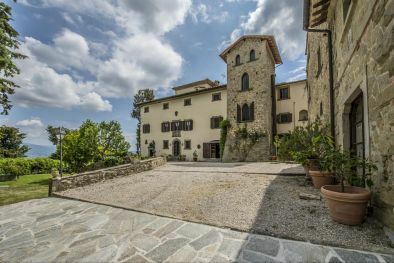 663 "FORTRESS WITH TOWER FOR SALE IN UMBRIA." 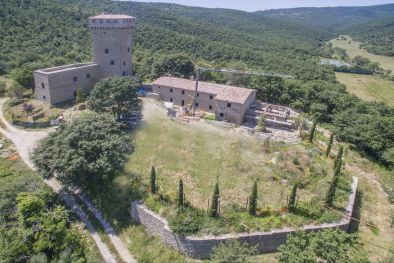 "FORTRESS WITH TOWER FOR SALE IN UMBRIA." POSITION: Hilly dominating position. Excellent views. FEATURES: Old stone construction, ceilings with wooden beams, old stone fireplace, battlements, fosse, old frescoes, arches, old tower. LAND: 4 hectares with 470 olive trees. 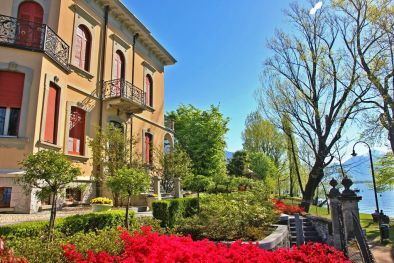 Foligno (16km; 27’); Spello (17km; 24’); Assisi (28km; 37’); Perugia (46km; 50’); Terni (70km; 1h 11’); Todi (79km; 1h 9’); Lago Trasimeno (61km; 57’); Cortona (90km, 1h 22’); Arezzo (135km; 1h 47’); Siena (150km; 2h 3’); San Gimignano (190km; 2h 38’); Firenze (192km; 2h 20’). Perugia Sant’Egidio (36 km;39’); Ancona Falconara (111 km;1 h 42’); Roma Ciampino (181 km;2 h 19’); Roma Fiumicino (201 km;2 h 34’); Firenze Peretola (205 km;2 h 25’); Forlì (210 km;2 h 45’); Bologna G Marconi (276km;3 h 18’); Pisa Galilei (296 km;3 h 9’). 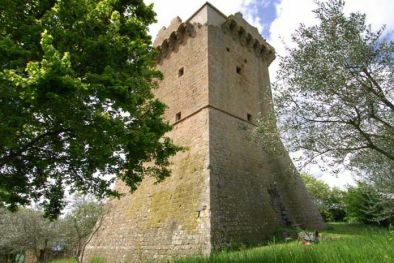 This ancient fortress is located in a valley at the confluence of two ditches, a short distance from a village, reachable within a short walk, with all the services. 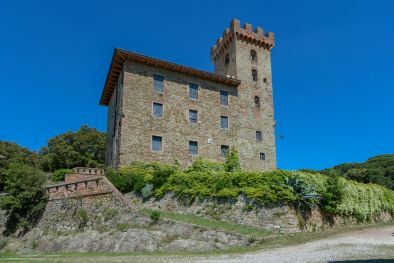 The property includes an ancient fortress with restored boundary walls, the remains of many buildings to be restored, the watching tower and the private chapel, now completely restored. The whole complex is dominated by an imposing crenellated stone tower pentagonal Guelph 32 meters high. 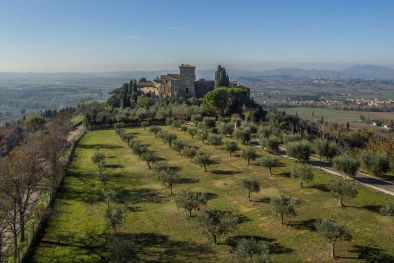 "Castello Torrito" was erected by a noble family of Foligno in the first half of XIV Century on a small hill surrounded by cypresses near a lush river, to protect the valley of Colfiorito considered of vital strategic importance. Structurally the horseshoe shape follows the trend of the hill on which stands the high-sided tower with Guelph battlements. There are only a few remaining walls, despite the fact that the family owner had several times reinforced it in the sixteenth century. A journey into the heart of Italy, of art, culture, wine and good food, between Rome, Florence and the Adriatic Coast, without neglecting the important and historic towns nearby such as Gubbio, Spoleto, Assisi, Spello, Montefalco and Bevagna is possible thanks to the very convenient baricentric position of La Rocca. Arriving by car, you can park in the rear of the tower and access within the court through a gap in the wall that leads the visitor on a central corridor reaching the church, and through the staircase, the terrace which gives access to the tower. The church has regained, thanks to the restoration, its original appearance, detaching hairpieces plaster walls, which brought to light, in addition to the wonderful times with selected segments, also part of a fourteenth-century crucifixion of age undergoing restoration. The garrison consists of two levels connected by a connecting staircase: the ground floor, with room for disables accessible from a branch of the central path can be traveled without architectural barriers and the first floor which houses the kitchen. The bedrooms, distinguished from the ceiling with wooden beams, is decorated with an antique bench parade, decorated with plants typical of the Baroque period, with a cabinet / cupboard made of walnut and oak of great thickness. All the bedrooms are equipped with heating and cooling system working with underfloor heating and ventil-convectors. The shower units are relaxing thanks to the pressurization groups making strong pressure hot or cold water. The kitchen is habitable and is characterized by a collections of kitchen utensils in copper and ceramic, exhibited on the walls, creating a warm atmosphere. The kitchen opens onto the terrace furnished with terracotta jugs, chairs and tables, useful to enjoy the coolness of the typical summer evening hours and can be used as a solarium during the day. From a wooden staircase, you enter the small door of the tower made of blocks of stone finely crafted highlighting the period of construction. The environment is dominated by the monumental fireplace flanked right and left by a pair of church benches dating back to the end of '600. From this room, a wooden staircase leads to a relaxation room with Internet Point, TV, telephone, stereo, furnished with sofas and armchairs suitable for reading, relaxing and being together, considering the large number of seats. Going up to the fourth floor we reach to the first bedroom of the tower, equipped with all comforts discussed above, characterized by a sober furniture dating back to the end 700. Going up to the fifth floor, you enter the second bedroom, very similar to the first for furnishing and size, but different in the roof, which, in this case is with a barrel vault of brick and stone, the other is with wooden beams. Going up to the sixth floor we reach the third bedroom, placed in what was the recovery room. Although more modest in size, both height and extension, this bedroom has a special charm as it has private access to the walkway / terrace with Guelph battlements, offering an unsurpassed view of the castle and the valley. The conservative restoration has given new life to this magnificent fortress by restoring the tower, the chapel and the surrounding walls. 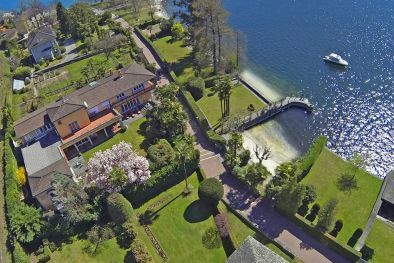 There are some annexes to restore, for a total surface of 570 square metres (6136 square feet). The property is completed by 4 hectares of surrounding land with 470 olive trees.